You’ve likely developed a content marketing strategy that covers your website, blog, marketing materials and internal communications, but do you have a content strategy specifically designed for your live events? If not, you could be missing a key element to boost your performance metrics. Most brands recognize event marketing as an integral part of their integrated marketing portfolio, and that can lead to great event experiences for your team and attendees… at the time. But are you leaving a lasting impression? 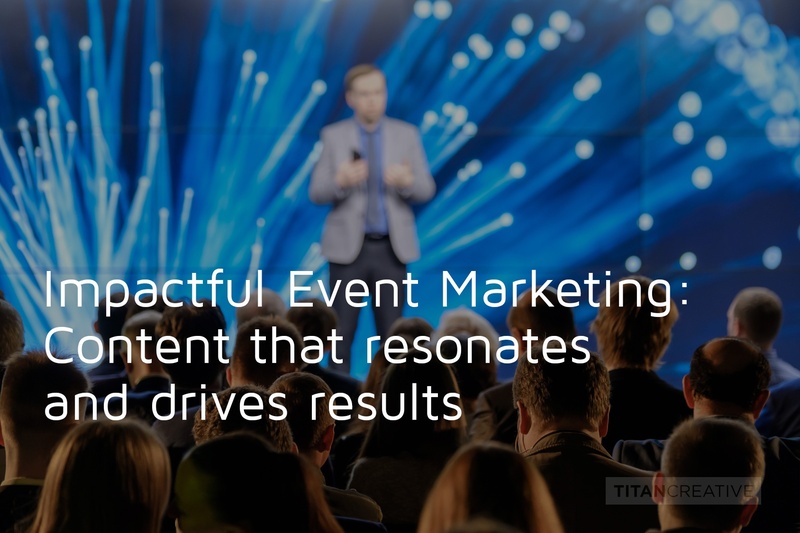 Creating a well-defined event content marketing strategy can take your event to the next level. What should I include in my content marketing strategy? If you approach event marketing with the same strategic focus you give other forms of marketing, you can leave a long-term impression that will generate more online engagement and offline activity for weeks or even months after your event. And that increases your potential to connect event results to new revenue. So how does your content strategy measure up to your event efforts? There are endless options to consider when developing your content marketing strategy to drive unique event experiences. It can be overwhelming to know where best to invest your time and budget. Interactive event apps, social media feeds, video, workshops, presentation materials, keynote speakers, tradeshows – the list can go on. At first, don’t worry about the platform. The key is a developing a customized approach to deliver the right content topics that directly align with your attendee interests. Ask yourself the following questions and then follow the advice to activate your event content strategy. Question 1: Does my event create genuine audience engagement? The key here is to truly understand your audience, their motives for attending and, most importantly, what will capture their interest. Will your attendees feel that your event is a valuable use of their time? What do you want your attendees to learn or know? How do you want your attendees to feel during the event? What will keep them talking about the experience that extends beyond that event? It’s important to address the questions your audience may be already asking and use the opportunity during your live interaction to fill those gaps. Your answers should create the content categories you need to address. Question 2: Does my event position our company as an industry thought leader? It’s one thing to pull in some great speakers with great stories, and offer nice amenities and swag. You need to make sure that everything fits together to tell the story of your brand, the right way. There are different ways to approach doing that, and it’s critical. Make sure you have some captivating talks delivered by your own people, and show attendees that you don’t just talk about innovation – offer hard evidence of how you are paving the way. They will remember the experience, and they’ll leave with a deeper impression of substance behind your brand. Question 3: Is my event helping build effective brand awareness? Events are chock-full of brand activation and thought leadership opportunities. By carefully framing every touchpoint around attendee interests, you are showing attendees what your brand’s value proposition is – revealing the substance beneath the sheen. Offer real value and you will start to build real interest, and generate trust around your brand. Attendees will remember their experience at your event far longer than they would remember reading a blog post. Don’t forget to capture and share lots of content so that you tell the story of the event – and widen the brand halo – on social channels. Question 4: Will I drive qualified leads for our sales funnel? Lead generation is another significant benefit to event marketing. Not only should you be considering lead generation opportunities – consider if you’ll be driving the right leads. Make those event interactions count. People find it easier to connect with and remember sensory experiences, and that is why holding an in-person event can help generate qualified leads. However, you need to provide the right content and experience that your customers are likely to remember and engage with. Assess your lead goals. Based on your target number of leads and demographics for a qualified lead, you can narrow in on the types of content you need to create. You’ll also be able to better determine what platforms and content stories your audience will engage with. For example, a younger, sales-driven audience may connect with you in advance on LinkedIn, or a B2C audience may respond to a series of Facebook video posts. When an event truly works, traditional barriers faced by standard marketing and online communication fall away. Your company can spend more time fostering two-way connections and participants will be eager to contribute. As a result, sales cycles are shortened, ROI is achieved, brand awareness increases and integral relationships continue to strengthen. Want to learn more about how we can help you drive results through event marketing? Rowena Alphonso is Senior Marketing Consultant and Strategist at Titan Creative Inc.